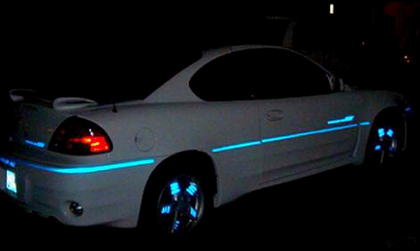 Auto Pinstriping in reflective LumaStripe vinyl will make your ride the coolest on the boulevard. Our reflective Auto Pinstripe looks like ordinary pinstripe in every way. However, at night this auto pinstripe will burst into bright reflective color! All colors reflect back the same color except for our black auto pinstripe which reflects gold at night. Each roll of auto pinstripe measures 37.5 feet long and are available from 1/10" thru 2" wide. Simply add our auto pinstripe to your shopping cart to select the size and color. Prices start at only $4.99 for 1/10"
Click AUTO PINSTRIPE to view see our colors and get prices on all sizes. 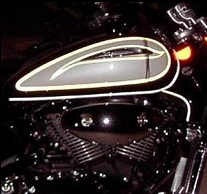 Our Auto Pinstriping can be used on your motorcycle for the ultimate in night time riding safety. You can use complimentary colors for enhanced style in the day, or you can use same color auto pinstriping for a subdued day look but explosive night time visibility of you and your bike! Note: Auto Pinstriping can be used on Bicycle wheels in addition to bicycle helmet decals to increase bicycle safety! Let us "cool" your ride!